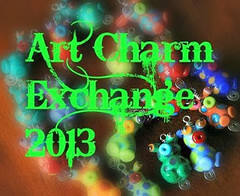 I think it's safe to say that every one of us wishes we had a significantly larger lampwork bead budget. Sometime, if we're lucky, we have a few spare dollars to spend on a set of happy colored lampwork spacers (my Etsy store being one source). 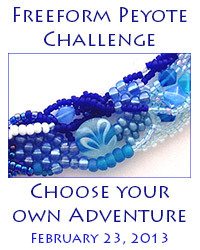 So, how do we make a few simple beads go a long way? Here's one idea for you! Well ... okay. 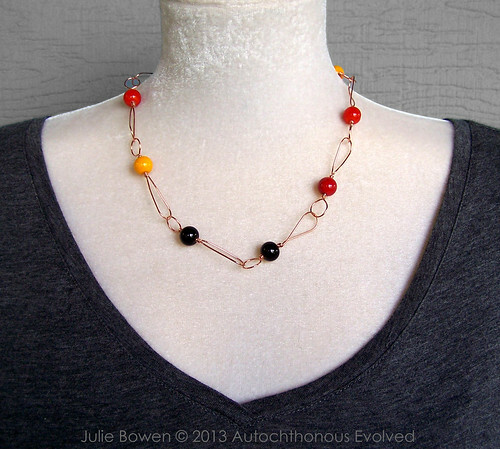 Maybe we wouldn't necessarily have a coordinating pendant, but I created this necklace using lampwork spacers to complement the pendant and I realized that the necklace by itself is still pretty amazing. 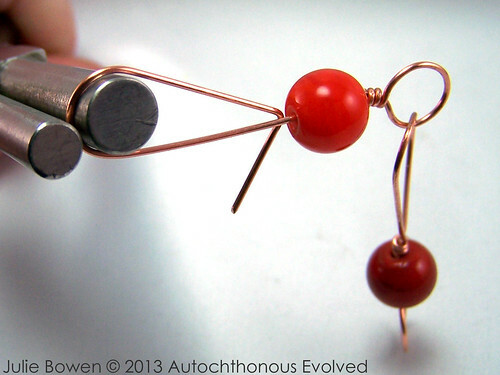 Here's a simplified version, not using the double-round-link connectors or connecting the teardrops with the rondelle spacers - but those are both things you could figure out after working through this tutorial! So, let's get started! About 1/2 inch from one end use the fat end of your bail-making pliers (or 3/8" dowel) to create a loop in a 5" length of wire. Be sure you keep a 1/2 inch tail as you create your loop. 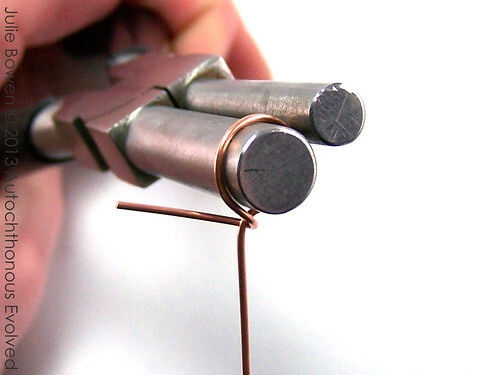 NOTE: If you want to make the links with two round ends,like some of the links in the top picture, instead of a teardrop loop you'll need a piece of wire that's 3 7/8" (3.875") long using a 5/16" bail making pliers and 10mm spacers. Obviously feel free to experiment on your own. We're starting a wrapped loop. As I begin to wrap the tail around the longer length of wire I stop when the tail is half-way around and use the wire tail as a fulcrum on which I can bend my main wire so it will be straight as I finish my wraps. 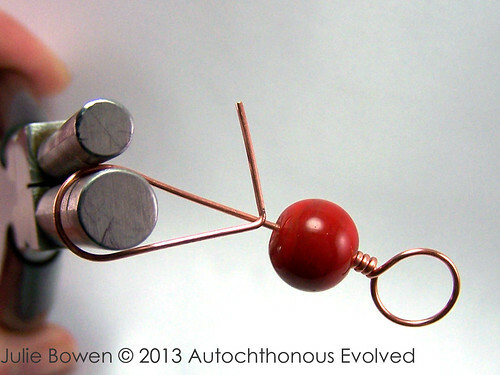 The aim when doing a wrapped loop is to have the wraps centered under the loop like a helium balloon. 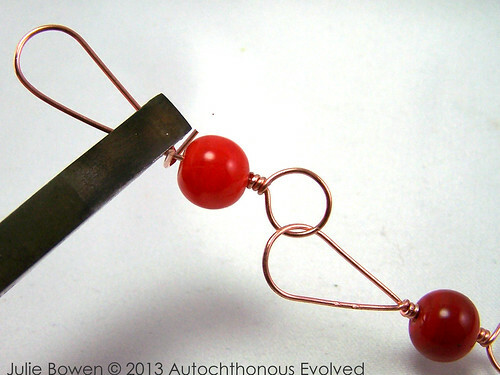 You can straighten the wire before starting to wrap and you can also do it later. I just think this particular method is the most efficient and pretty. Your finished wraps should look like this. For the beginners, remember that you don't have to do anything to move the wraps down the wire. As long as the wire tail is at a 90° right angle from the main wire, pressing the wire straight around the wire is all you need to do. 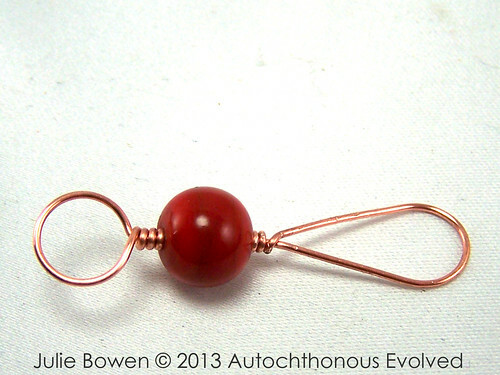 The wire will naturally slide past the previous wrap and settle into place. Next slide on a bead. 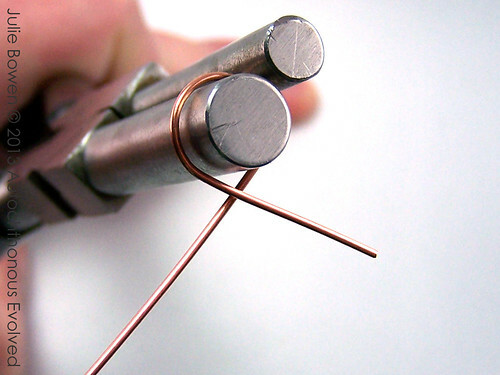 Use your flat nose pliers to create a 90° bend 1/2" from the end of the wire. 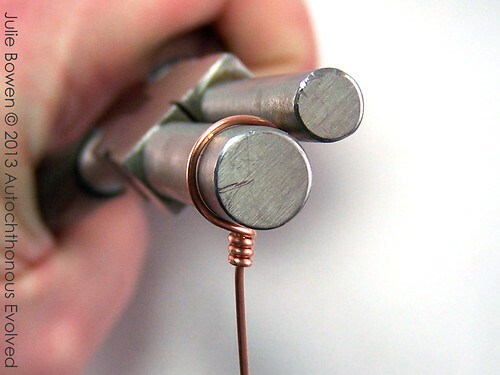 Place your bail making pliers or dowel in the approximate center of the wire between the new bend and the bead. 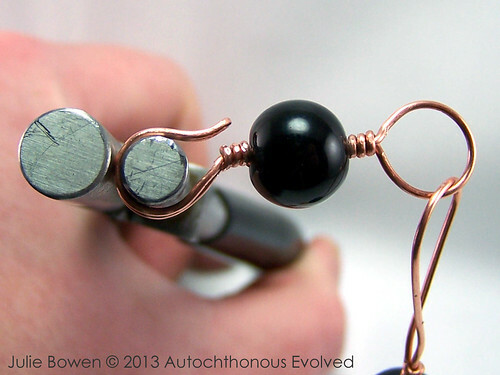 Bend the wire around the plier jaw or dowel until the bend touches the wire coming through the bead. 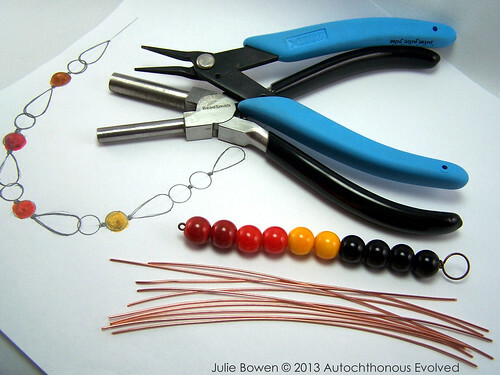 Make sure the bead is against the wraps on the other side and make and final adjustments if necessary. It is important to remember to leave a space between the bend and the bead about the same size as the wraps on the other side of the bead. If you don't you'll either have a gap because you left too much space, or the wire will push the bead as you finish the wraps and distort the loop on the other side of the bead. Just pay attention. Measure until you can trust your eye. 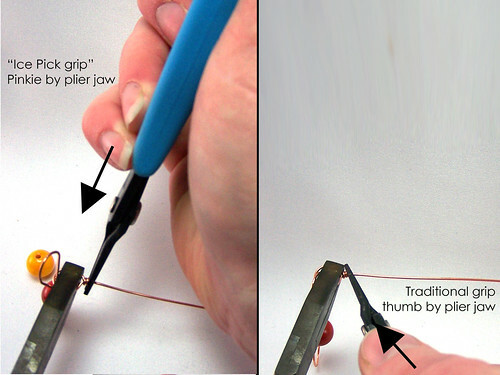 Use your flat nose pliers to gently but firmly grasp the teardrop loop right next to where the wires intersect. If you have new pliers, be sure to file the edges (called dressing the pliers) before grabbing the wire, otherwise the pliers will leave marks in the wire. Once you have a hold on the wire use your fingers and/or the chain nose pliers to wrap the tail. To finish wrapping the last little bit of tail I use what I like to call the Ice Pick Grip. Instead of having your thumb pointing toward the plier jaws, turn the pliers around in your hand so your pinky is next to the plier jaws. Most people will have a firmer, steadier grip this way. The disadvantage to using this grip all the time is that it has a different range of motion than we normally use, but for finishing a wrap, this is perfect. One link down. If you look carefully you can see that I left tool marks on the teardrop side. If you have a problem with this, putting tape (any kind, really) on the jaws will help cushion the wire. Like any tool coating (like Tool Magic) you'll have to replace the coating (tape) sooner than later. 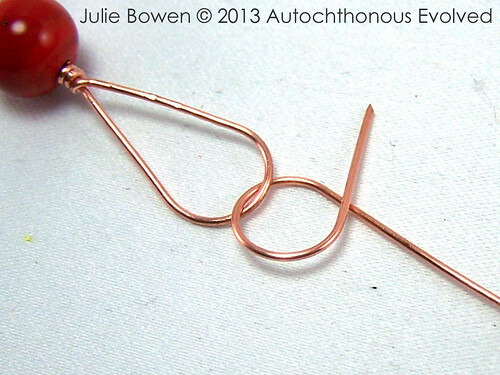 As before, you'll use the bail making pliers or dowel to create a loop 1/2" from the end of a new wire. 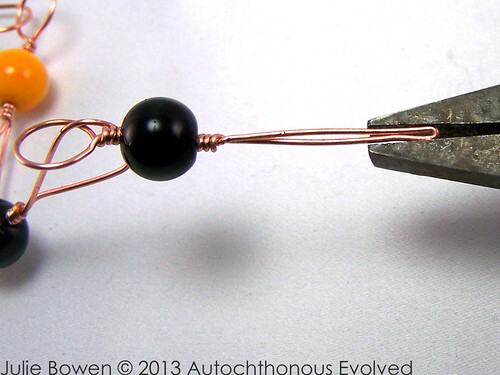 Attach the new round loop to the teardrop loop on the last link. Gently grasp the round loop with the flat nose pliers, with the old link on the opposite side of the pliers from the new tail. Use your fingers and/or chain nose pliers to wrap the tail as with the previous link, remembering to straighten the main wire. 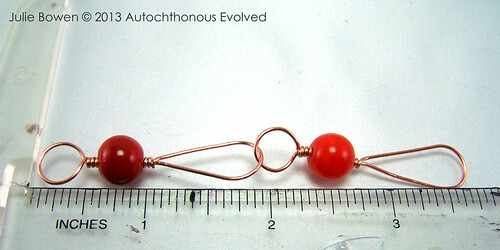 Finish the wraps and slide on a bead. 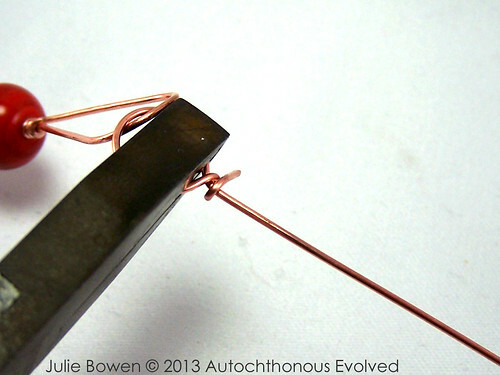 As before, create the tail by bending a 90° angle 1/2" from the wire end. 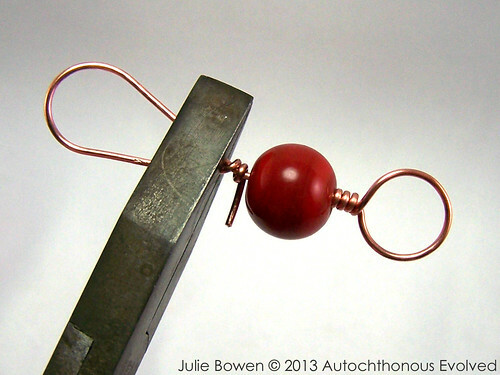 And like with the last link, use the bail making pliers or dowel to bend the wire into a teardrop shape. Don't forget to use the Ice Pick grip, turning the pliers as you tighten the grasp of the jaws, to finish wrapping the ends of the tails. Each link is about 1 7/8" in length. 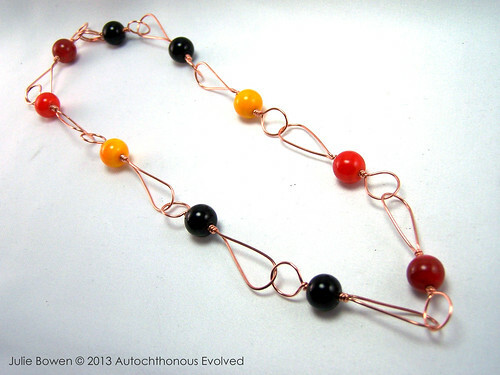 So ten beads will produce a necklace that's between 18 and 19 inches in length. To make the clasp (using the 7" piece of wire if you want to keep the necklace a little longer), use the flat nose pliers to carefully flatten the teardrop loop on the last link. Put a little quarter turn bend in the end of the flattened link. 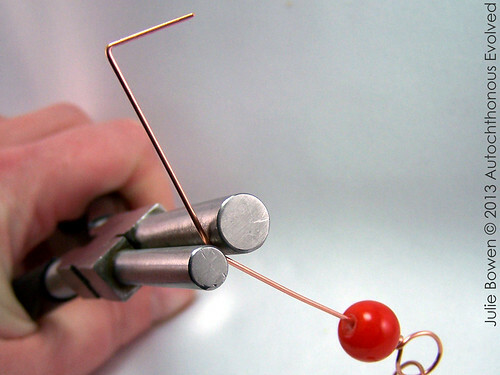 Place your bail making pliers (or a smaller 1/4" dowel or the fat base of a round nose pliers) at the center of the flattened loop and bend the wire until the end barely touches the wraps next to the bead. A properly formed hook clasp sort of snaps onto the connecting loop, preventing accidental disconnection. 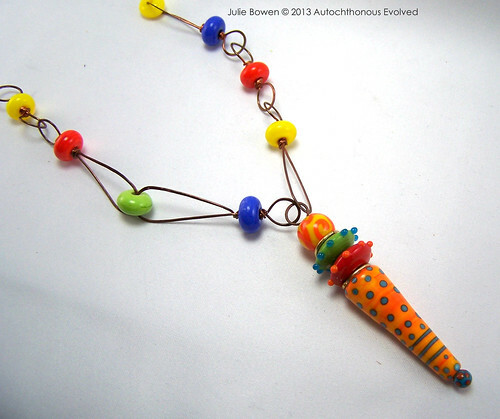 Do you guys have designs you already use for lampwork spacers? Should I post more tutorials like this? I'm so happy you like it, Lori! 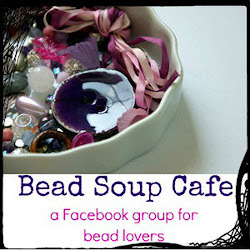 I do love sharing ideas for making beautiful beads go a a little further. Wire is such a great medium!